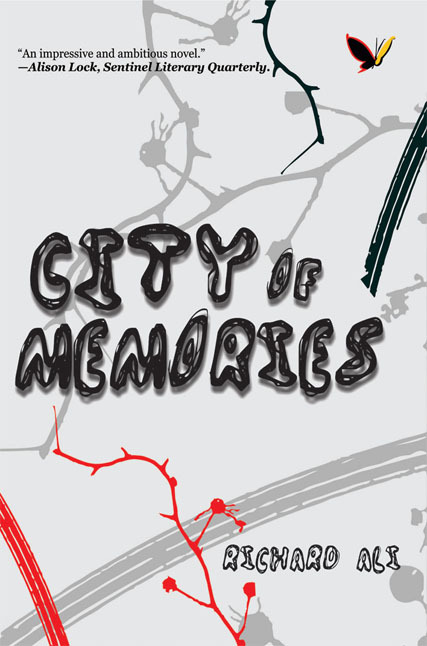 City of Memories follows four characters negotiating the effect of various traumas. Towering above them is the story of Ummi al-Qassim, a princess of Bolewa, and the feud that attended her love—first for a nobleman, then for a poet—a feud that bequeaths her with madness and death. All four are bracketed by the modern city of Jos in Central Nigeria, where political supremacy and perverse parental love become motives for an ethno-religious eruption calculated to destroy the Nigeria State . . .
A thwarted love affair forces Faruk to flee to the Northeastern village of Bolewa, from where his parents emigrated three decades earier. There, he unearths his mother’s tragic story and discovers the key that just might keep his country one—if he can make it back to Central Nigeria alive. Author of the warmly received 2012 novel, City of Memories, Richard is also Editor-in-Chief of the Sentinel Nigeria Magazine and was a runner-up at the 2008 John la Rose Short Story Competition. In March 2008, he was selected amongst 50 other emerging Nigerian writers to participate in the British Council’s Radiophonics Workshop. He joined the Sentinel Literary Movement of Nigeria in 2011 and has undertaken the editing of its quarterly Sentinel Nigeria Magazine [www.sentinelnigeria.org] since then. He is also on the Board of the pan-African Transcultural Academy chaired by Beverly Nambozo Nsengiyunva at the forefront of redefining African literature and its study.